The composition of the Earth’s lower atmosphere is dominated by Nitrogen and Oxygen. However, in the Earth’s upper atmosphere [above an altitude of 600 kilometres] the dominant gases become Hydrogen and Helium. based on mass spectrometer measurements [Johnson, 1969; Luhmann, 1995]. 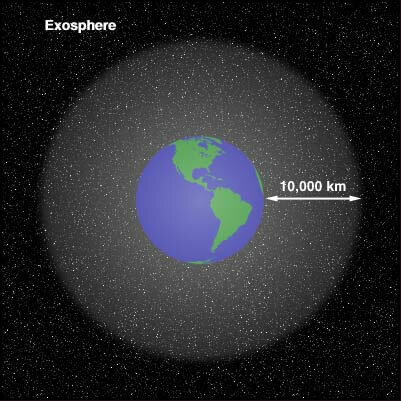 Although the particle density in the Exosphere very low [compared to the lower atmosphere] the volume of the Exosphere [extending out to 10,000 kilometres] is 50 times larger than the lower atmosphere below 600 kilometres. Helium in the Exosphere is clearly identifiable in ultraviolet images. 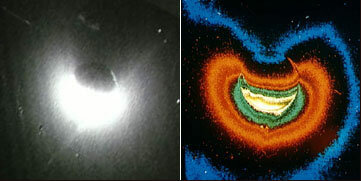 Hydrogen in the Exosphere is also clearly identifiable in ultraviolet images. Inquiring minds at this point are probably wondering where all this Hydrogen and Helium originates from because the lower atmosphere only contains 5.24 ppmv [0.000524%] Helium and 0.55 ppmv [0.000055%] Hydrogen. 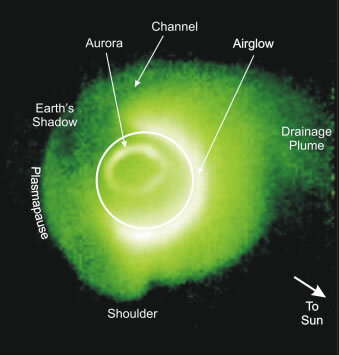 The Hydrogen that accumulates in the Exosphere is partially explained by the photodissociation of water vapour [in the lower atmosphere by solar radiation] into hydrogen and hydroxyl radicles. United States Naval Ordnance Test Station, Pasadena and Inyokern, Calif. Solar radiation dissociates water vapor into hydrogen atoms and hydroxyl radicles. Hydrogen and hydrogen peroxide molecules, and perhydroxyl radicles, are also produced as a result of subsequent chemical reactions with the allotropic forms of oxygen. The rate of the oxidizing processes falls off more rapidly with increase of altitude than does that of the reducing processes, and the hydrogen compounds are almost completely broken down at about the 90-km level (or even lower). There is a continual escape of the hydrogen atoms into interplanetary space; but the liberated oxygen atoms remain in the atmosphere, and the number that must thus have been added in geological time seems to be comparable with the number now present. However, this partial answer only leads inquiring minds to ponder the source of the Earth’s reserves of water [in all its forms]. The answer to the riddle of the Earth’s atmospheric Hydrogen and Helium is very interestingly answered by an amazing paper by Arie Gilat and Alexander Vol which very convincingly extends and updates the pioneering work of Vladimir Larin [see Hydride Earth: The New Geology of Our Primordially-Hydrogen-Rich Planet (Polar Publishing, Calgary, Canada, 1993)]. 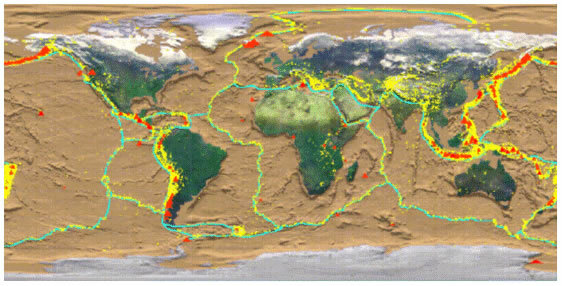 with earthquake epicenters (yellow dots). (Compiled after Internet data, mainly provided by USGS Smithsonian Institution sites and NOAA/NGDC). 1. Primordial Helium and Hydrogen form solid solutions [and possibly sub-lattice bubbles of helium-hydrogen in Fe-Ni] inside the Earth’s solid core. This is an endothermic process which helps to cool [and compact] the Earth as it is accreted. 2. Hydrogen and Helium [with densities lower than those of the surrounding medium] provide trickles and concentrated flows of buoyant bubbles [the core and core-mantle boundary] which cannot be distributed uniformly in a heterogenic [in chemical composition, structure, temperature, stress] medium. Rising bubbles quickly become hotter than the surrounding medium because of the temperature gradient and grow in volume. It is important to note that Hydrogen and Helium are the only gases which do not cool adiabatically [Joule-Thomson effect – http://en.wikipedia.org/wiki/Joule-Thomson_effect%5D. 3. The concentrated flux of hotter-than-mantle hydrogen and helium from the core generates liquid magma by a process of volatile flux-melting. The magma rises through the denser surrounding medium and the resulting decompression provides additional heating of the magma due [primarily] to the exothermal expansion of the entrained Hydrogen. 4. The [initially] accelerating gas-magma rises through pre-heated channels as a diapir [or plume] melting overlying rock. The velocity of the rising gas-magma mix stabilises due to the endothermic formation of solutions, endohedral clusters, and chemical compounds. 5. The gas-magma mix scavenges trace elements and forms He-H, He-O, He-C, He-S, He-N, He-metals and other compounds which may later be concentrated in the lithosphere as volcanic gases and ore-forming hydrothermal solutions. 7. Decompression of the gas-magma mix in fault zones may result in the explosive decomposition of H- and He- compounds [at depths up to 680 kilometres beneath the surface] which cause minor earthquakes and the formation of kimberlite pipes – see http://en.wikipedia.org/wiki/Kimberlite_pipes. 8. The explosion of He-compounds may destroy the initial deep earthquake hypocenter which causes a fall in pressure and the release of additional H and He compounds which drive further explosions that proceed upwards through a main earthquake shock and its subsequent aftershocks. 9. High-temperature [greater than 1,000 C] brines from deep sited aquifers may be pushed up through the fault zone and [when rising to a spot of stress release in the upper 300 meters of the rock sequence] instantly become steam [with a volume increase of up to 1,700 times] which cause phreatic explosions and the spontaneous combustion of any inflammable volatiles. One line of evidence supporting the Gilat and Vol hypothesis relates to tectonic earthquakes [that occur at depths of up to 700 kilometres] where the rock cannot accumulate elastic stress because high temperatures cause the rock to slowly creep [viscous-like deformation]. A second line of evidence is the established industrial processes which generate hydrogen from Natural Gas and the observation that Helium can reach concentrations of up to 7 percent in Natural Gas. In the earth’s atmosphere, the concentration of helium by volume is only 0.0005 percent, so it cannot be obtained in significant quantities through air separation. a) Decay of radioactive elements [Uranium, Thorium and others]. b) The heat caused by gravitational compression and differentiation. c) Heat generated by impact of meteorites. d) Assign the balance of the heat flow to “primordial heat” left over from the Earth’s formation about 4.5 billion years ago. e) Overestimate the heat generated by radioactive decay. Alternatively, the exothermic outgassing hypothesis presented by Gilat and Vol is far more convincing and is worthy of very serious consideration. Gallery | This entry was posted in Atmospheric Science, Catastrophism, Earth, Geology, Inflating Earth, Science, Water. Bookmark the permalink. Another explanation is to include the earth into a solar system electrical circuit. The explanation by Gilat etc assumes an accretion model, or more simply the standard model based on a Big Bang. Alternatively if we consider planets as fizzled out stars, then prolonged Zpinch mechanism would compress matter into the familiar core, mantle form, that then is seriously out of equilibrium once the electric currents forming the Z pinch stop or reduce. Use this model plus the plasma circuit and we have an energy source.